Ingredients: Glucose Syrup, Sugar, Sweetened Condensed Milk (from whole milk) 22%, Vegetable Oil (Sustainable Palm Oil), Butter 3%, Salt, Molasses, Emulsifier (E471), Flavourings. May contain traces of nuts. 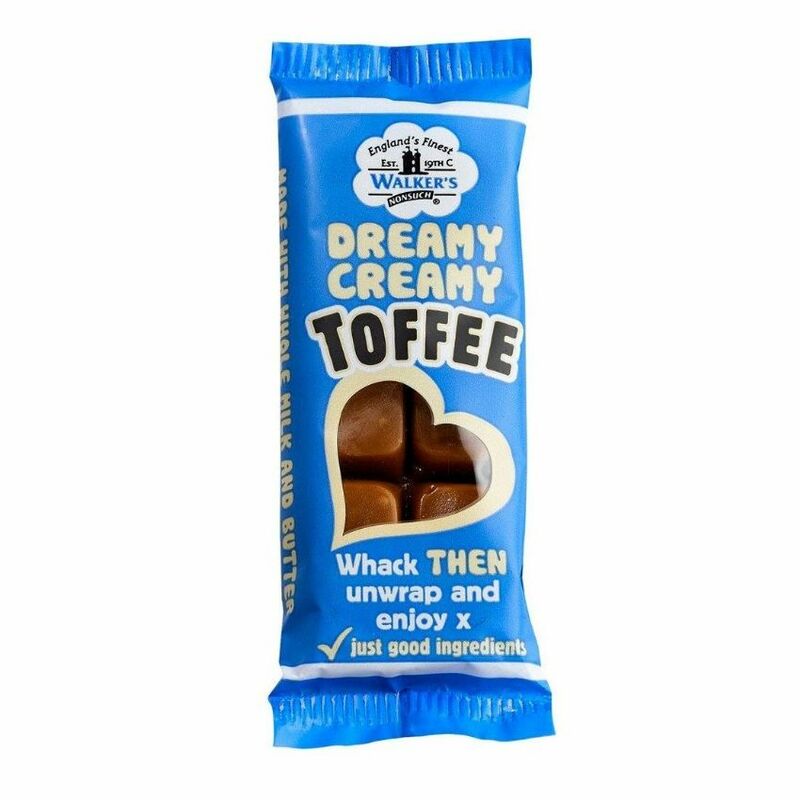 From a tiny sweet shop in Longton, Stoke-on-Trent during the 19th Century, Edward Joseph Walker began making toffee for a handful of local customers. Using only the finest ingredients he created a unique recipe which is still used today. Toffee prepared to this recipe has made Walker's a favourite for over a hundred years. Nutty Brazil Ingredients: Glucose Syrup, Sugar, Sweetened Condensed Milk (from whole milk) 20%, Vegetable Oil (Sustainable Palm Oil), Brazil Nuts 5%, Butter 4%, Salt, Molasses, Emulsifier (E471), Flavourings. Dreamy Creamy Ingredients: Glucose Syrup, Sugar, Sweetened Condensed Milk (from whole milk) 22%, Vegetable Oil (Sustainable Palm Oil), Butter 3%, Salt, Molasses, Emulsifier (E471), Flavourings. Lovely Liquorice Ingredients: Glucose Syrup, Sugar, Sweetened Condensed Milk (from whole milk) 21%, Vegetable Oil (Sustainable Palm Oil), Black Treacle 5%, Natural Colour (Vegetable Carbon), Liquorice Extract 0.7%, Salt, Emulsifier (E471), Oil of Aniseed. Yummy Banana Ingredients: Glucose Syrup, Sugar, Sweetened Condensed Milk (from whole milk) 22%, Vegetable Oil (Sustainable Palm Oil), Butter 3%, Salt, Molasses, Emulsifier (E471), Flavourings.